Each day anywhere between 2-4pm it rains, and it’s not just a little bit of rain, it’s RAIN – there’s lightning every 10 or 20 seconds and it turns the roads to mud in no time flat – except for the main road, the roads are not paved here! I’ve only been here 3 days but every piece of clothing I own is absolutely saturated, if not from the rain, then from the 24-hour-a-day sweating because of the 200% humidity. And the rain doesn’t stop until the early hours of the morning, betwen the rain banging on the roof and the really loud fan, sometimes I don’t get a lot of sleep. I tried to buy some more clothes today but there aren’t that many places in this small town to buy clothes and what is there is real touristy. Although I’m not sure exactly what I’m looking for, the few things that I did find were the wrong size. I can’t try anything on because just spending 2 minutes in a shop without air-conditioning makes me break out in a massive sweat. The internet here is patchy at best, it worked fine for the first two days but today it has been cutting in and out. Generally it’s not too bad though. The class itself has been good, I look forward to our lessons each day. The teacher is quite strict, pointing out every mistake but that’s good really I think. I hope one doesn’t land on me while I sleep. I’m not planning to write up one of these every day… but it’s currently raining so hard that there’s not a lot else to do! I was very nervous when I left Dallas, I was almost hoping the plane would have to turn back for some reason! Texas is a lot greener than I thought – I think I mentioned that in my last post. Eventually I arrived at Liberia Airport, which to me was kind of what it would be like to fly into Te Kuiti Airport. That building there is pretty much the entire airport. Stepping off the plane the heat really hits you, it must have been 5 degrees in London when I left and now it feels like 500. Once outside the airport, there was chaos – many locals trying to sell taxis to the gringos. I had to try and find my pre-booked taxi amongst the crowds of people trying to sell their taxi services. I was picked up by a couple of guys in a real beat-up old car that I wish I had’ve taken a photo of, but it looked like a mid 80′s Datsun. We stopped on the way to buy some beer (drinking and driving didn’t seem to be a problem here, although it was only one) and I got accosted by some one asking something about one dollar. My drivers told me he was a crazy person and to ignore him. I did take some photos from the car. They took me to my host family’s house, and straight away there was a problem because I’d already paid for the taxi, but the taxi driver said he hadn’t been paid. So I said in my broken spanish that I’d paid the school, so they got the school on the phone and we sorted it out in English luckily. My room is nice, it’s small, but it’s got a fan thank God, and my own little bathroom. I rested for a couple of hours, but because it was so hot I didn’t get much resting done. After half an hour all the power inexplicably went out (apparently it happens a lot here), which meant that the fan stopped working, and that I literally started melting. At 6pm I went to the school where I’ll be studying spanish for 4 weeks. They were going to give us a tour of the town but because the power was out and there was torrential rain we couldn’t do much. So, after sitting around chatting for a while, I went back to the host family’s house. It was pitch black, pouring with rain, and I had to cycle home a mile or so through a new town that doesn’t speak English. And I’d seen first-hand how the locals drive. It was scary but all part of the adventure! The photos aren’t particularly interesting, because once I got to my host family’s house I did a lot of sleeping and there was no power, and it’s been raining almost since I got here. So far it’s all gone pretty much like I expected, I can get the gist of what my host family says to me but often can’t reply, but I’m looking forward to starting school tomorrow. And no matter how long I’m here, I’m not going to get used to putting used toilet paper into the rubbish bin instead of into the toilet. Took the first flight of my trip today with American Airlines. It’s the first long-haul airline I’ve flown with where they don’t give you free alcohol! What a rip off! And the TV in the seat wasn’t “on demand” – you had to wait for the show to start, or you had to start watching the show in the middle of it. I arrived at Dallas/Fort Worth International Airport in Texas at 6.30pm local time. It’s a lot greener here than I expected, I expected it to be more desert like Las Vegas. Got a taxi ride to the place where I’m staying for one night, but the taxi driver had no idea where it was. We went round and round in circles, on the freeway, off the freeway, back on, off, u turns here and there, but we eventually found it, and he didn’t charge me for all the driving around in circles. The confusion was because my confirmation said “Walnut Hill Drive”, but it was actually “Walnut Hill Lane”, and the driver says that the receptionist was giving poor directions. But when I checked in, I met the most eccentric hotel receptionist ever. She was raving to me about some confectionery called a “Chick-O-Stick” (it’s “Crunchy Peanut Butter and Toasted Coconut Candy”), and when I said I’d never heard of it, she gave me one of hers. And then I said I’d never heard of the other thing she was raving about, a “Skor” bar, and she gave me one of those too and told me to put it in the freezer. Plus she gave me free internet and a free room upgrade, she was awesome. I’ll be flying out at 10am tomorrow to Costa Rica. My time zones are a bit messed up, it’s 3am Sunday in London, so it must be 2pm Sunday in New Zealand and it’s 9pm here in Texas. Almost every TV channel seems to be taken up by a tornado in Yazoo City, Mississippi. PS I haven’t seen George Bush yet but I hope to. I don’t want to jinx it… but looks like I might be flying out on Saturday to Costa Rica! On Tuesday night they suddenly announced that all UK airports will be opening again effective immediately. Quite a shock announcement. I almost wasn’t going to post this because I didn’t want to jinx it, but I don’t see any reason now why on Saturday I won’t be flying. My flights to LA and Vegas were cancelled twice along with those of my sister because of the volcanic ash cloud. So, instead I went with my sister and spent a week up in the North-east of England with a day trip to the Lake District. It’s not quite Vegas, but we got to stay with family which was really nice. CLICK HERE FOR PHOTOS OF THAT TRIP. So, my sister’s Vegas trip is now going to be the first week in July instead. A bit sad for her really as I think she wanted to go this week, but at least it will be happening sometime… hopefully. It feels like I’ve been on the phone forever – to American Airlines, the hire car company, ebookers, hotels, rail companies, bus companies… I just don’t want to be on the phone anymore! I hope the small town in Costa Rica where I’m going has no phone reception. American Airlines – really helpful every time I called them. Ebookers – never answered the phone – was on hold for over half an hour, and with access to only a mobile phone, it was excruciating knowing how much it was costing to be on hold. Tried to do things through their website, and kept getting “we have encountered an error”. GAH! Carhire3000.com – they’re good for USA bookings from the UK because they cover all necessary insurance, etc. But I’m annoyed with them because it says in big letters on their homepage “No Cancellation Fees”, however when I tried to cancel my rental car, they wanted to charge me a £109 fee. Go figure! Another example of blatant false advertising. This whole debarcle could have cost me a ton more – because it looked so unlikely that the airports were going to reopen, I was going to book a 17-hour bus ride from London to Madrid, and book a one-way flight from Madrid to Costa Rica at a cost of £1,100, and then carry on with my original flight itinerary as planned. Then, I learned that if you miss the first leg of your flight itinerary, you’re not allowed to travel on any of the remaining legs, even though you’ve paid for them and have confirmed seats! What a crock! In addition, the bus to Madrid from London required me changing buses in Paris with a 75 minute layover, and in Spain with a 45 minute layover. If I did something wrong, or the bus was late, that would have been VERY costly. In addition, I tried to get through on the phone to buy rail tickets through Europe instead of the bus. I tried over five hours over two days. It was engaged every single time. Boy there must be a lot of stranded people out there. The rail company being engaged turned out to be a blessing in disguise. And also, to make up for having to postpone our Vegas holiday, we’re now making it two days longer. It’s always important to look at things from a positive angle – even though sometimes that can be very hard! On TV they were advertising CoolHandPoker.com, it seemed okay so I thought I’d give it a try. I used a new email address to sign up – one that I hadn’t used for anything else. I signed up in December 2009, and now (April 2010) I have begun receiving spam to the email address I signed up to Cool Hand Poker with. And since I only used that email address to sign up to the poker site with, and nothing else, I know they’ve sold it, or otherwise let spammers get hold of it. So PLEASE BE CAREFUL if you sign up to CoolHandPoker. You will get SPAM! Our online Prime Play ensures maximum security and safety for its players. You can even hide your membership from your wife and neighbours. The email didn’t link here of course, but I’m not going to give the spammers the benefit of a link! Note how the spam is suspiciously poker-themed, even further confirming my theory! There’s a link on Cool Hand Poker’s website labelled “Spam Policy”. Funnily enough it doesn’t work! I’ve emailed them about this spam – let’s see if they reply. EDIT: Here’s their reply… almost sounds personalised! Almost. I don’t believe a word of it though. Thank you for contacting Cool Hand Poker. I’m sorry to hear that you’ve been receiving spam. I know all about how irritating and time wasting it can be. Please let me assure you, however, that we do not sell any player information, especially personal details such as email addresses. In order to operate under license from the Government of Gibraltar, there are several requirements we need to meet with regard to the maintenance and safeguarding of player information. Any sale of player information would undermine all the work we have to do in order to obtain a gaming license in the first place. I know exactly what kind of emails you’re referring to, as I have received them as well, to my private work email address which is not registered on *any* online poker sites. I do understand why you feel that we may be responsible for you receiving this type of spam though, due to the nature of the spam email. I hope that you will reconsider your decision as we value you as a Cool Hand Poker player. As always, thanks for choosing Cool Hand Poker, your play is appreciated. If you’d like to earn some bonus Cool Points very quickly, have a seat at one of the green Cool Hand cash game tables. We’re giving away 5 x Cool Points to players who play at those tables. You can use your Cool Points to buy in to tournaments and you can even exchange them for cash if you have enough points. Should you require any further assistance, or wish to offer any comments or suggestions, please feel free to contact us. Our friendly helpdesk is available 24 hours a day, 7 days a week, for your convenience. So since Thursday the 15th, all UK flights in and out have been grounded because a volcano erupted in Iceland and the ash is drifting over the country. So that means it looks like I’m not going anywhere, two days later it’s still hanging over the UK and isn’t showing any signs of going, in fact it’s getting worse. I was supposed to be spending from April 16-24 in Los Angeles and Las Vegas with my sister, and then on April 25 she was gonig to come back to London and I was going to go on to Costa Rica. Our flight out was cancelled, and we’re rebooked for tomorrow (Sunday 18) but it looks like that will be cancelled too because the ash isn’t going anywhere. So my sister won’t be getting a holiday at all by the looks of it. And the longer this ash continues, the more of my holiday I’m going to lose, and the more it’s going to cost me. I’ve booked Spanish classes in Costa Rica starting April 26 but if I can’t get there, they’re not refundable, and they cost a lot of money. Also, I moved out of my flat, so if we don’t fly by Sunday, I will have nowhere to live. For me, a week or two out of a 10 week holiday is not the end of the world, but I’m very sad for my sister who was looking forward to her week-long holiday since December. It’s kind of heartbreaking really. But I keep hearing about people on the news who are stuck in countries where they don’t have visas, and people whose relatives are sick or have died, and they can’t travel to be with them, so I like to complain as little as possible because there are people out there with much worse problems than me. I’ve spent hours playing these two games – I think you have to be a geek to like them, but I think they’re fun! Blosics 2 – Fire balls at stacks of green blocks to knock them off the screen, but don’t let the red blocks fall. Taberinos – Launch your ball at the evil white lines, in order to clear the playing field in as few moves as possible. Do you think they’re fun too? Remind me not to go to Calvada Springs in California. Despite saying to myself “nobody’s going to trick me today” several times on the walk to work today, I still got caught out by some April Fool’s day jokes. I said that I wouldn’t get caught again after last year, when my team circulated a memo saying “management have asked us to do a code review – we need to look through all the code in our application and remove all the swear words”. I fell for it. But today, when the team said that we need to get our Russian new joiner a Russian keyboard or else he couldn’t do any work, I believed that too. At least I didn’t believe the Guardian story on Labour’s election campaign posters! They are a fake response to the Conservative party’s real billboards, one of which I saw while I was out running last night. I think all these posters are quite cool. 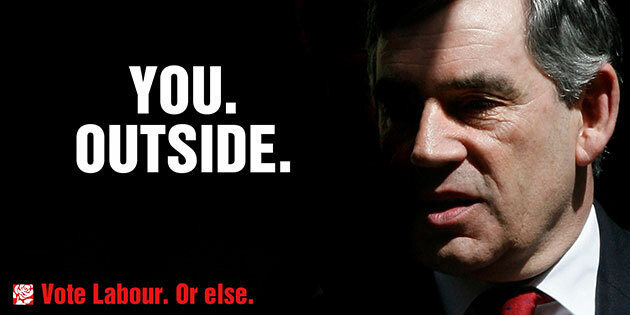 On a side note, I will be so depressed if Gordon Brown wins the election. Powered by WordPress. Fazyvo 1.4 by noonnoo. Log in.